This turned out to be a fabulous pre-workout meal with just enough carbohydrates and protein. Plus it wasn't too heavy! I had this puppy whipped up in about 20 minutes therefore qualifying this dish for the OPM (one pan man) series. Bring 1 cup chicken broth and quinoa to a boil over medium heat in a small sauce pan. Once boiling, reduce to low heat and cover, cook for about 15 minutes, or until water is absorbed. While quinoa is cooking, heat a large skillet over medium heat. Once hot add EVOO, garlic, and chili garlic sauce. Once garlic is fragrant (about 2 minutes) stir in onion and tomato, cooking until onion is softened, about 5 minutes. Add spinach leaves and cook until wilted. Then add the remaining chicken broth (1/2 c.), beans and 3 tbsp. of their liquid, and seasonings. Stir until well combined and reduce to simmer until ready to serve. 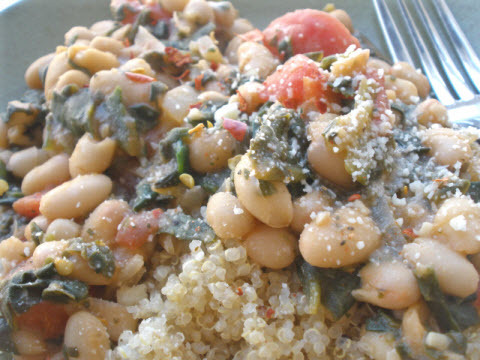 Spoon white beans over the quinoa to serve. For a vegan modification, substitute veggie broth for chicken.